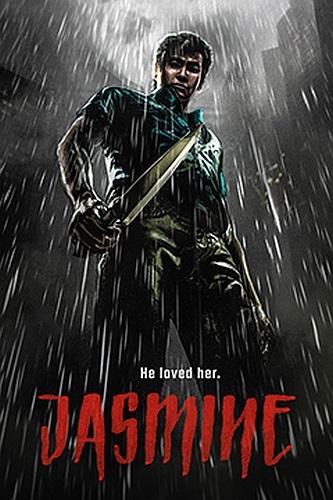 JASMINE (2015) begins as a study in devastating loss, with Leonard (Jason Tobin, #1 SERIAL KILLER, TOKYO DRIFT) still suffering over the murder of his wife Jasmine a year ago. Returning to Hong Kong from some self-imposed exile, with the scars on his wrists still healing, he tries to ease his way back into society while wandering listlessly through a bleak world of his own unending pain and despair. Director Dax Phelan's feature debut (he also co-wrote the script with Tobin) is almost too effective a study in unbearable sadness for the viewer to endure, as the first half of the film details Leonard's vain attempts to make simple human contact again while struggling through each day, lonely and going nowhere. Until, that is, the moment he first spots a mysterious man visiting Jasmine's grave, and then later sees the same man in the subway late at night at the very spot where Jasmine was murdered. Convinced that this is the man who murdered his wife, Leonard begins to follow him everywhere. Then, after breaking into his apartment, Leonard makes a shattering discovery--physical evidence that he is indeed the man who killed Jasmine. This is where JASMINE stops being merely a sad story about loss and becomes a tense thriller in which we're uncertain just how far our hero may go to avenge his wife's murder, or indeed just how much of this is real and how much may simply be a figment of his overheated imagination. The suspense builds during Leonard's gradual descent into a sort of controlled hysteria. His encounter with a woman named Anna (Sarah Lian), whom he has seen with the mystery man, begins with him assuming a coolly ingratiating fascade that deteriorates as his inner obsession boils to the surface and has her running away in fear. What ultimately transpires is one of those sudden twists that turns everything on its head and leaves us utterly disoriented. After this shocking development, we're forced to start going over everything that's happened before in our minds, re-evaluating it, and, in the process, finding some of it a bit baffling. It all ends up playing like an extended "Twilight Zone" episode, with some of the earlier passages seeming somewhat padded in retrospect. Still, Phelan's direction is visually interesting--dialogue is often minimal, allowing his well-rendered images to carry the story and let us know what's going on in Leonard's mind. And while not fully satisfying at the end, I found JASMINE to be both a pleasing cinematic exercise and an engaging psychological study that's worth delving into.